A little bit of inside information always helps. The people who choose to eat at the Taco Bell at 11th and Chestnut need help in two regards: someone needs to tell them about South Philly ahead of helping them find due South. Maybe they’ll permanently leave the contraceptimelt behind after dropping into Taquitos de Puebla or Taqueria La Fonda Prima. Or, they can enjoy some of the city’s best tacos by visiting South Philly Barbacoa, a food cart at 8th and McKean that does business every Saturday and Sunday from 6a.m. until whenever they sell out. My inside information comes from getting to know Miller and Martinez (read my piece on them here) from back when they were dishing up Sunday barbacoa to friends and industry folks [Disclaimer: Yes, your waiter was intoxicated if you ever ate past 8:30pm on Friday or Saturday in the basement at the OG, 108 Chestnut Han Dynasty] at their house. So, when they did their last pop-up at Taproom On 19th, I already knew that you could select any cut from the whole baby lambs they slow cook over 10 hours atop steam racks within massive pots. During that Cinco de Mayo pop-up at Taproom, Ben asked me what I wanted as I eyed separate mounds of lamb and pancita. 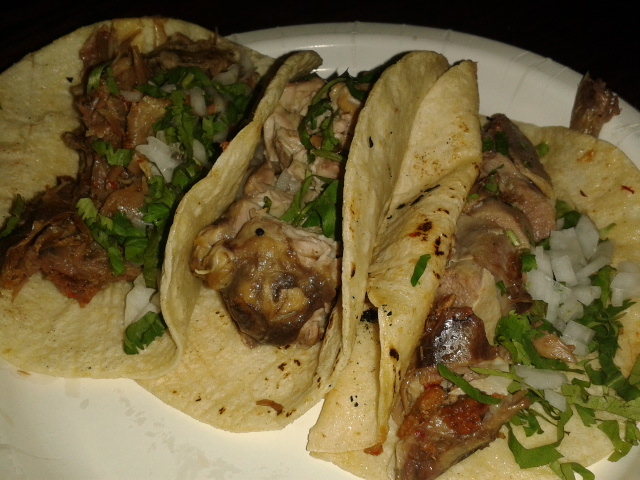 Costillas and lengua, I quickly responded before hesitating. I had done the cabeza (head meat), the shank, and even los ojos (eyes) with cheek. I can get you some brain, Ben quickly interceded. And then, in the most Friday The 13th of ways, he preceded to hack open the lamb’s skull with a Jason Voorhees approved cleaver before prying it open with his gloved fingers. 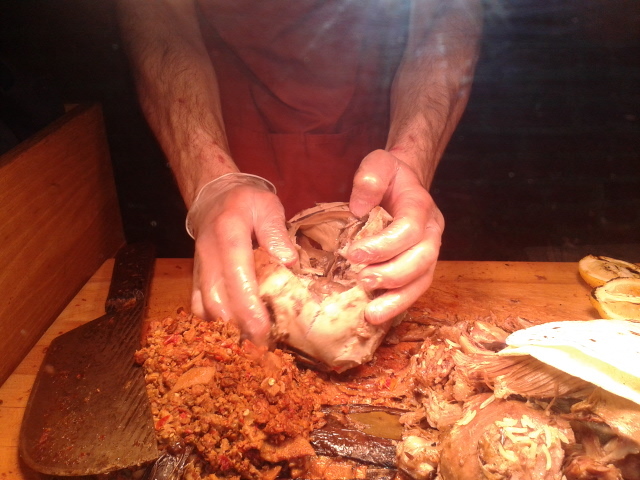 The sheep’s brain, of course entirely intact–hello pons, hello cerebellum–reminded me of undergrad lab practicals. Even for someone who eats a lot of offal, it was a bit off-putting at first. “Here you go,” Miller said, ladling on some flavor rich consommé, since, like thymus, eating brain is more about texture. A sprinkling of cilantro, onions, and salt, along with a squeeze of lime, and I was all set. And despite the appearance, it was far creamier than expected, with the steaming broth seeming to add to the effects of a long slow cook inside its cranial cage, the creaminess buttressed by the robust, lamb heavy notes of the consommé. Brains are hardly anything new for Miller. At Kanella, where he previously worked as a prep cook, one special featured them poached in milk with a bay leaf prior to being chick pea battered, fried and served with lemon. He says his former boss, Konstantinos Pitsillides, would wax nostalgic on how his grandmother served him lamb brains spread on toast as a boy. I’m aware, of course, that brain tacos, or brains served in any manner, may not be for everyone. I’m also aware of how much of an understatement that last sentence is. That notion was recently reinforced while watching The World Cup at Fado. During half-time, a med student’s face turned a collage of disgust, disbelief, and horrified panic as I adjoined my brain taco experience to her stories from anatomy lab. In retrospect, it was probably not a good lead-in. I told her that, as someone who did a senior thesis on prion’s disease, I wasn’t always a big fan of brains either. But she just kept making that face. Perhaps she would have done better with the saffron brainaise that accompanied grilled lamb at a recent dinner at Monsu. Or, there’s the roasted lamb’s head that chef Joe Cicala of Le Virtú has made: split lamb’s head seasoned with salt and pepper, white wine, rosemary, garlic, red pepper flakes, and breadcrumbs. Brain mingles with tongue and cheek as you pick at a rustic, Abruzzese delicacy that is similar to Sicilian or Greek preparations (there’s only so much to do with a split skull). 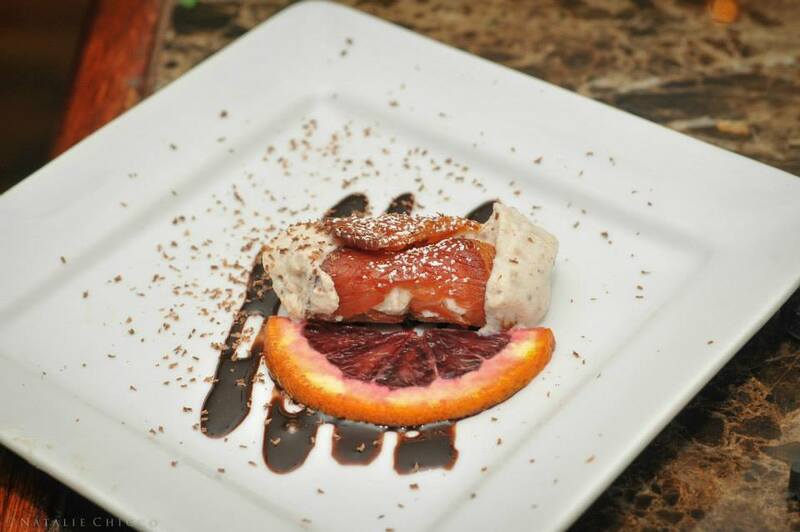 Pig Brain Cannoli by Melissa Torre of Cookie Confidential. Photo by Natalie Chicco. I experienced the best way of serving up brain to diners timid or otherwise when visiting South Philly Barbacoa in early June. Besides my usual motivations for visiting, Miller had told me that he was doing a limited run of crispy brain tacos. “Usually, I deep fry them,” he said as I sat on one of the chairs he places opposite the cart. Eating a lamb barbacoa taco and sipping a Mexican coke*, I waited as he pan fried the tacos in oil on the grill top. 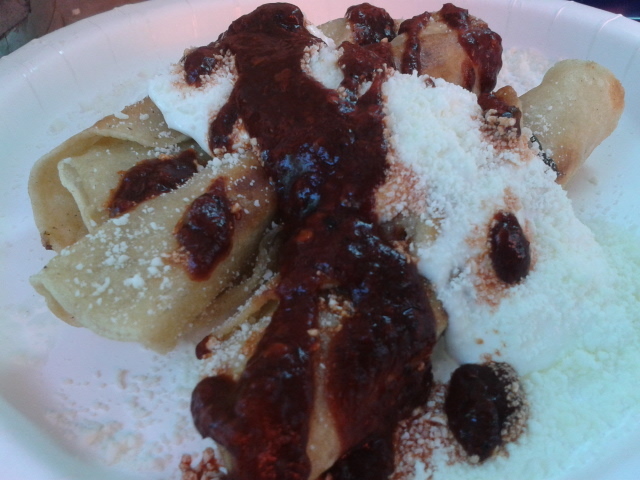 Rolled up tightly, the crispy tacos–with head meat blended in with the brain–had a flavor similar to that of the ground beef, ricotta, and fresh herb cannelloni from Superior Pasta by Christian and 9th. In both cases, you enjoy the synergy of dough and fatty, flavor rich meat. Here, the brain and cabeza enjambs with a daubing of crema Mexicana and an accumulation of queso Mexicana, while being played upon by an appropriately spicy salsa roja. And it’s all presented in a way that anyone can enjoy. But, appearances aside, it’s only that first bite that matters. All the better–if white and grey matter is understandably not very appealing to you–if Miller only told you they were crispy cabeza tacos. Since that flavor stays on your brain. 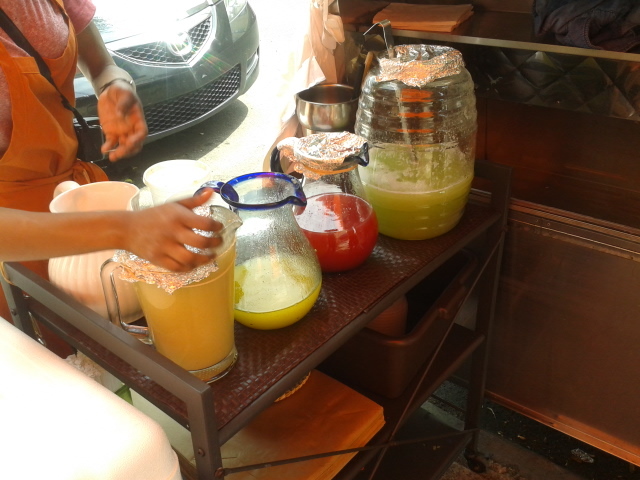 *Try the aguas frescas they’ve recently added, which features simple syrup mixed with either blended and strained pineapple, water melon, or cantaloupe, as well as their take on agua tamarindo. ← Recurring Dinner Series, Omakase Philly to Launch Monday May 12th at Monsu.